The açaí bowl is probably one of the biggest food trends. 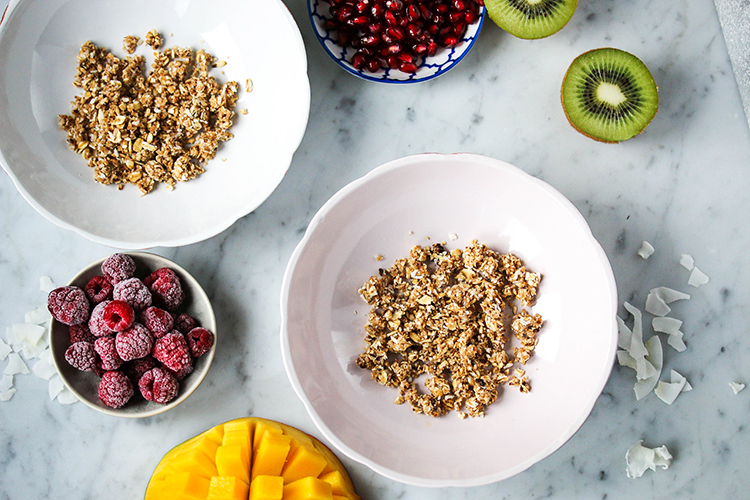 It’s basically a beautiful smoothie made with frozen berries and presented in a bowl. 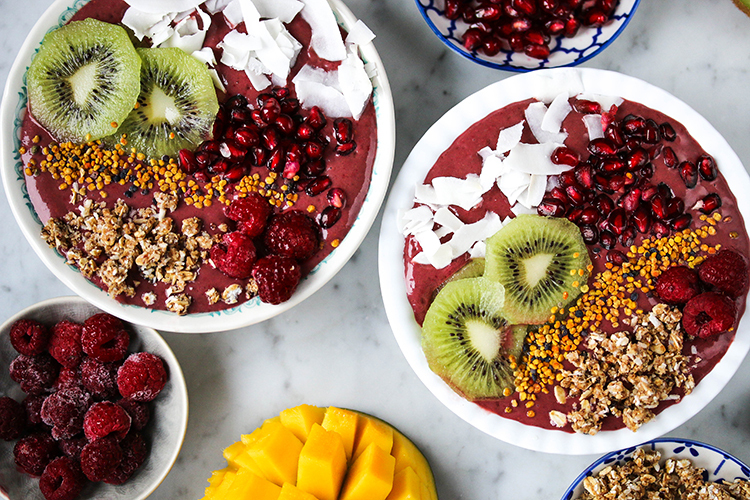 Açaí bowls are not only very pretty, but also super healthy. I ate many açaí bowls in my life, and I can’t wait for warmer days so I can enjoy delicious açaí bowls even more often. After introducing rawnola into my life, I think I now created the best açaí bowl and I love to share it with you today. Often you will find that baked granola is used, but this bowl is entirely raw because of the rawnola. But feel free to use (baked) granola if you have that in your kitchen. 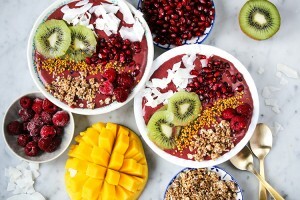 How to make the best açaí bowl? Here we go! An açaí bowl is basically a really thick smoothie (thick soft serve) that is topped with oatmeal, nuts, granola, fruit and/or a nut butter. If you have never tried an açaí bowl, go and make this one. You will see it is not just a fad, açaí bowls are really delicious and here to stay! Açaí is basically a superfood from Brazil. Açaí berries have an array of health benefits, but its strongest asset is definitely its delicious taste. With this açaí bowl it’s difficult to say whether I’m enjoying an ice cream or a healthy breakfast. At the same time it makes me feel so good. My body loves it. I feel energized the entire morning. 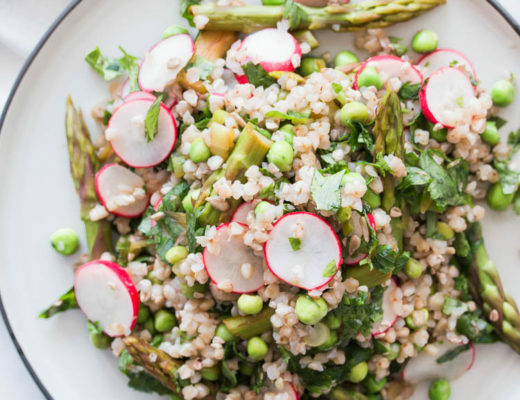 This bowl takes a bit more time than an average smoothie where you can just throw everything into a blender, but once in a while the extra time to make this bowl is completely worth the effort. If you are located in the US, you can find açaí berries as frozen puree, packed in little portions. However, to my surprise I found it in Germany, Luxembourg and Belgium as well. 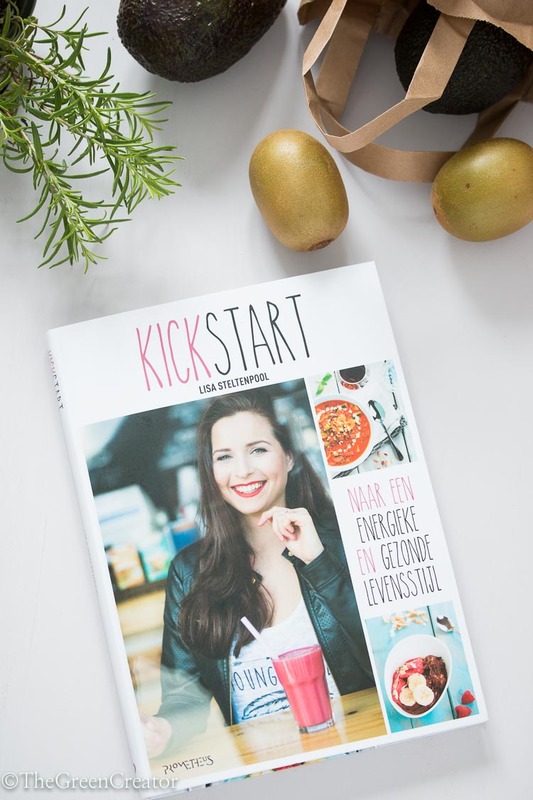 So look in your local super market/health food store in the freezer section to see if you can find frozen açaí puree. You could also use açaí powder instead, but it may not have the same taste and texture as in this recipe. 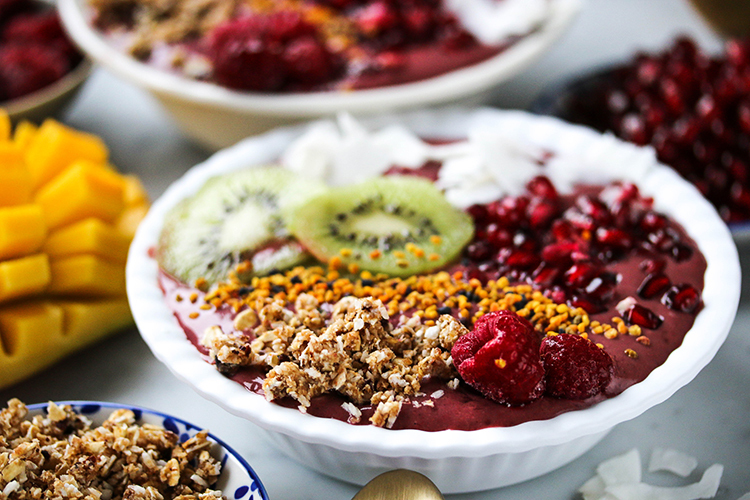 This acai bowl is a bursts of colors, fresh ingredients and a fusion of flavors! açaí berries have an high level of antioxidants. açaí berries are low in sugar, but contain good amounts of calcium, iron, fiber, and vitamin A.
they defend the body against harmful free radicals. açaí berries have healthy levels of fiber. 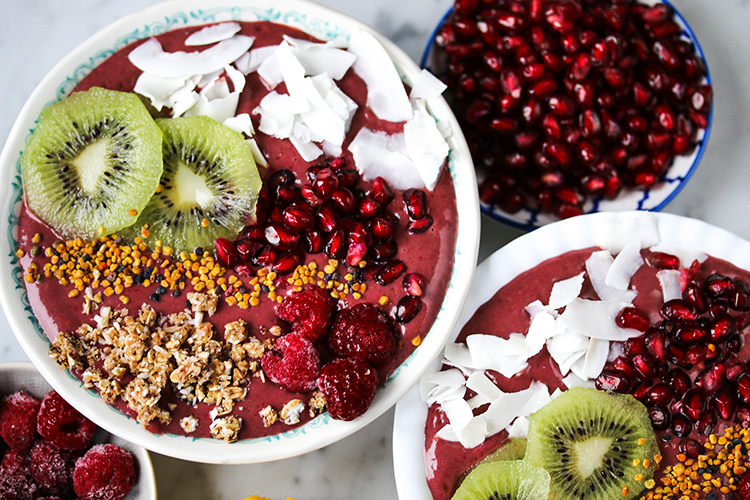 A perfect açaí bowl is not only very beautiful, but also super tasty and healthy. 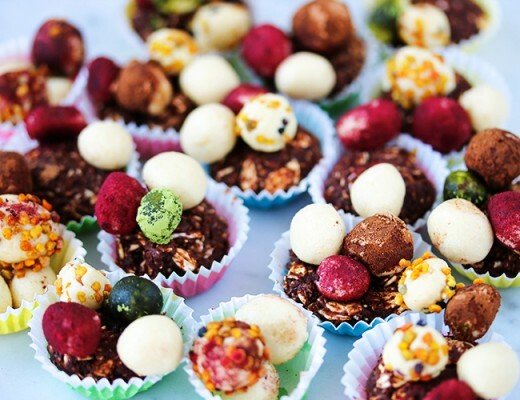 This recipe contains raw granola as a topping and on the bottom of the bowl. The almond butter, frozen berries and mango with the açaí puree makes this the best açaí bowl ever! Prepare a bowl with a layer (2-3 tablespoons) of rawnola or granola. Add the frozen banana- or mango slices, the almond milk, almond butter, frozen berries, açaí, maple syrup to a blender/food processor and blend for a few minutes until smooth and creamy. Pour this over your bowl on top of the rawnola/granola and top with your favorite toppings. If the smoothie is still too thick let the blender run longer or add more almond milk or coconut water. If the smoothie is too thin, add more frozen fruit.